Nuclear reactions inside the Sun raise its temperature to millions of degrees. About 8 billion tons of material of the Sun is converted into energy each second, generating 3.8X10^26 watts of energy each second. This amounts to more energy produced each second than all human-generated energy production since creation. Each square inch of the Sun shines with a brightness of 300,000 candles. Luckily, only about a billionth of that energy reaches earth. Also fortunate, is that sound does not travel through vacuum. If it did, nuclear explosions in the Sun would deafen us. Also lucky for us, we are not any closer to the Sun than we are; otherwise, we would be pulverized in an instant. Also lucky for us, our own planet has three mechanisms that deflect most of the Sun's energy before it reaches ground. The first mechanism involves molecules high in the atmosphere, that absorb radiation energy from the deadliest X-rays and gamma rays from the Sun. The second mechanism is the ozone layer, which protects us from ultraviolet radiation. Third mechanism is the earth's magnetic field, that deflects solar wind away from the most populated areas of the Earth. At the end of the day, all we get is the much needed warmth and just the right amount of energy to power life. Total yearly energy use of all people on our planet is 15 terawatts. 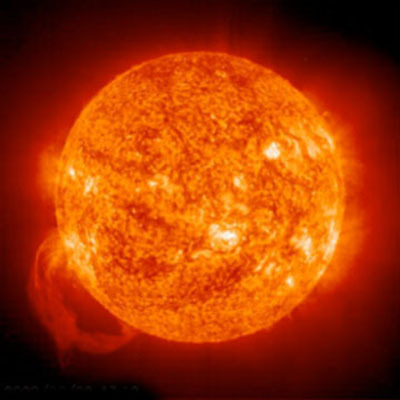 The amount of energy that reaches earth from the sun is 89,000 terawatts. That is 5900 times more than we need. That's why it's a no-brainer why development of ways to harness that energy are such a hot topic today. There's all this free energy coming at us from the sky all the time, and all we need to do, is concentrate the dispersed sun light into a concentrated energy stream. DeYoung, Donald B. Astronomy and the Bible: Questions and Answers. Grand Rapids, MI: Baker Book House, 1989. Print.